Scientists from the University of Essex will soon release a school of pollution sensing robot fish off the coast of northern Spain. The hope is they will eventually be able to detect toxic pollutants in river systems, lakes and oceans across the world with their special chemical sensors. Ships, boats, underwater pipes and other man made contraptions can leak a whole range of waste material, polluting our natural aquatic environment. These five foot long fish will capture information on such pollutants and transmit them back using WiFi technology, that is, ultrasound. The seal size fish can swim for hours at a time but at £20,000 each we expect they'll be given adequate rest and techy tune ups for their eco warrior part in cleaning our waterways. What's extra special about these robot fish is that they can navigate their way around without us humans getting in the way of their job. But why a robot fish? 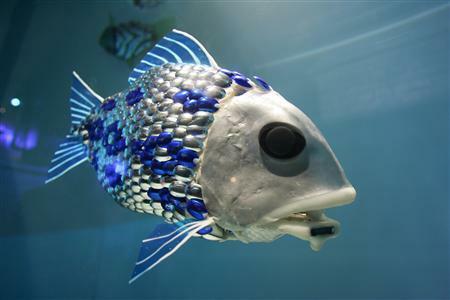 Mr Rory Doyle, one of the senior scientists who developed the fish told Yahoo News: "In using robotic fish we are building on a design created by hundreds of millions of years' worth of evolution which is incredibly energy efficient. This efficiency is something we need to ensure that our pollution detection sensors can navigate in the underwater environment for hours on end."